The photos I couldn’t possibly post…. To be honest I felt that these photos were photos that I couldn’t even take, and so decided not to……Why? Well that will perhaps become clear. It was a school excursion to a museum, the pupils were having at this particular photographic opportunity, a lot of fun, they were laughing hysterically in fact. I suspect it is going to be an excursion that hangs in the memory for quite some time. It was an excursion day for a relatively small group of sixteen year olds. Twenty four pupils in all. The whole group were pupils who have chosen art as an exam subject. As part of the course my colleague organizes a couple of times a year museum visits as an extension, and enrichment, of the classroom program. Last Friday we were visiting Rotterdam, first a session in the Kunsthal and after that the Boijmans van Beuningen museum. 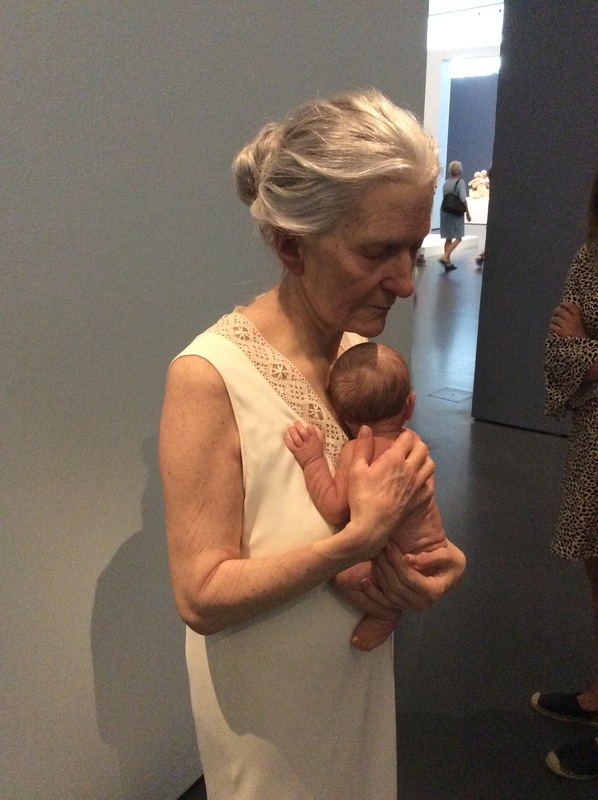 In the Kunsthal we saw the Hyperrealist sculpture exhibition. It was an exhibition with a wow factor, certainly for our pupils. They had never seen anything like it. 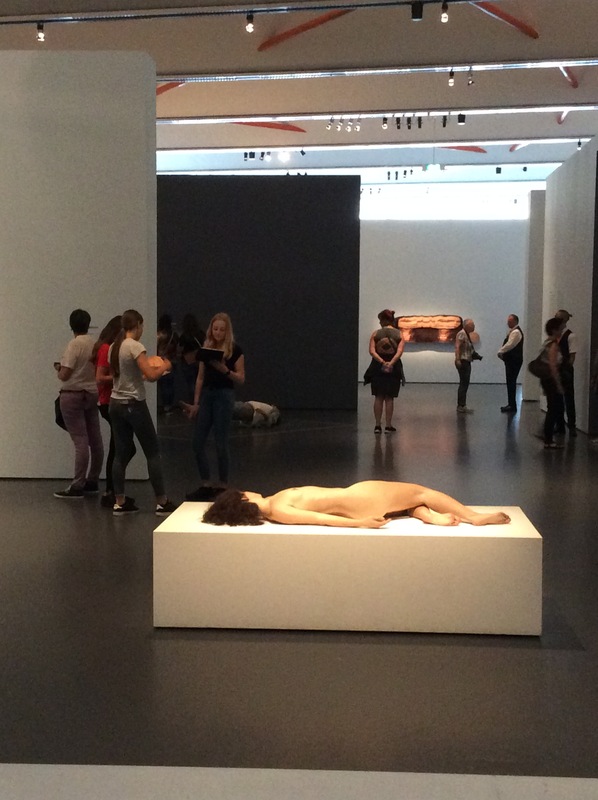 Duane Hanson, John deAndrea, Ron Mueck and many others. 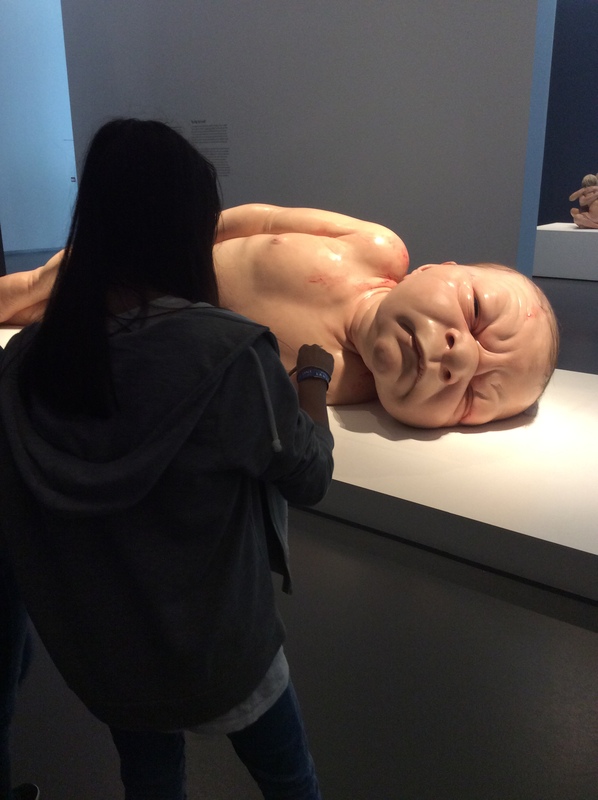 The strange confrontation that these life like sculptures bring, the permission that they give to stare at the human body without embarrassment and the slightly alienating effect of it all had our class transfixed. They were focused in a quite different way than I think I have ever seen pupils in a museum before. It was a good start to the day, the pupils left the museum for lunch talking about what they had just seen, which as a teacher is exactly where you want them to be. But then there was still the afternoon part of our city visit still to come…..
We regathered on the steps of the Boijmans museum ready for our second cultural dose. We were principally there for the museum’s permanent collection and had arranged two guides to lead our pupils through some of its high points. As we had hoped, particular attention was given to the museum’s collection of Surrealist art. Although, my group also had a really nice discussion with our excellent guide about performance art. Time was nearly up when our guides brought our two groups pretty much simultaneously to one last work, a piece by the Vienna based artists’ collective Gelatin. They explained that it was an art work that invited a form of participation, although it was entirely up to visitors as to whether they actually did. There was no pressure to do so if you didn’t want to. We entered a first space with what at first glance looked like racks of clothes. Well, they kind of were, but kind of weren’t! But they were garments of sorts, designed to be pulled on over your normal clothes. Rather than describe the rest at length, maybe it’s easier to just add a link to Gelatin’s own website showing photographs from the opening of the exhibition in Rotterdam just a few days ago. I have to admit to being a little surprised, partly by the artwork itself, but more so by the reaction of a significant number of our group. They just couldn’t wait to get involved and pull some of the outfits on! Thereafter there really was little to be done to control the hysterical laughter. This really is going to be an excursion that is going to be discussed for years! The artists themselves clearly want their work to have a sharp element of humour. But it is also about dissolving hierarchies by, in a way, equalizing physical appearances, through imposing a sort of artificial nakedness. Most of the girls couldn’t wait to try on the male outfits to huge comic effect. They were happy enough to take photos of themselves and each other, but somehow it just didn’t feel the right thing to do myself. Restraint seemed appropriate. It also felt extremely appropriate not to join in with the artwork myself…..I feel absolutely sure that my pupils wouldn’t have been able to show the same restraint had I pulled on one of the skin coloured overalls. It would certainly have been a photo that would have been shared throughout the school and that would have subsequently followed me round forever! I’ve always been a bit of a Sol Lewitt fan. He was an important artist to me in the sense that he was one of the first artists who challenged me to think about the role of the hand of the artist in making an art work. I was aware that many artists in the past had worked with assistants to help them execute their work, but Lewitt’s conceptual pieces where he offered just a list of instructions were the first that I came across that took the physical presence of the artists right out of the equation. An example of this approach is the Wall Drawing #118 made in Boston. Since coming across his concepual, instruction based pieces I have regularly encountered his wall drawings and sculptures in numerous museums and galleries. Here in The Netherlands we are lucky enough to have a number of venues than have from time to time featured his work. One of these is the BonnefantenMuseum in Maastricht. A few years ago they staged a fantastic four-man show featuring Lewitt, Mangold, Serra and Nauman. Part of this collection was a returning installation work in the dome of the museum that had been installed now for the third time, and for the first time since the artist’s death in 2007. I visited the museum a couple of days ago and returned sttaight away to view the Lewitt Spiral. Its one of the monochrome works that the artist produced alongside the many colour based works he made. But somber it is certainly not. It has a truely geometric fizz, a sharpness of line that draws you in a integrates itself with the architecture of the building. Alongside the Lewitt painted dome interior there is an exhibition of the work of Cai Guo-Qiang. It, like the Lewitt installation has something of a monochrome, even charred feeling to it. It includes many of the Chinese artist’s trade mark explosive paintings that were executed by igniting explosive charges on the surfaces of the works and displaying the scorched results. The works undeniably have an abstract beauty to them and also have at times intense colour due to the chemicals added to the firework explosives that are used. Alongside these more well known pieces there is an extensive documentation of Cai Guo-Qiang’s earlier work from before he turned his practice in the direction of explosive work. These parts of the exhibition document sensitive paintings and drawings, portraits and self-portraits, family photographs and even drawings produced by the artist’s daughter as she has gradually become older. Seen altogether a surprisingly biographical insight into an artist’s existence, both inside and outside the art-world spotlight. I have quite a soft spot for the minimalist, post-painterly abstract paintings of the 1960s and 1970s. I’m too young to have memories of the work as it happened and made its way into museums and galleries in the period, but it was important to me particularly during my years at art school where it was a regular reference point to many of my teachers. From this perspective it was interesting to visit the de Pont museum in Tilburg (the Netherlands). Alongside the permanent collection they have a temporary show, not of the aforementioned abstract work from forty to fifty years ago, but of a curious juxtaposition of light installations and graphic work by the American light artist James Turrell and historical Amish quilts that are all eighty or more years old. It is a strange combination, an extensive collection of beautifully made bed quilts and a documentation of Turrell’s extensive sky observatory work at Roden Crater in Arizona, alongside a number of his museum space installations of projected light creating geometric forms. 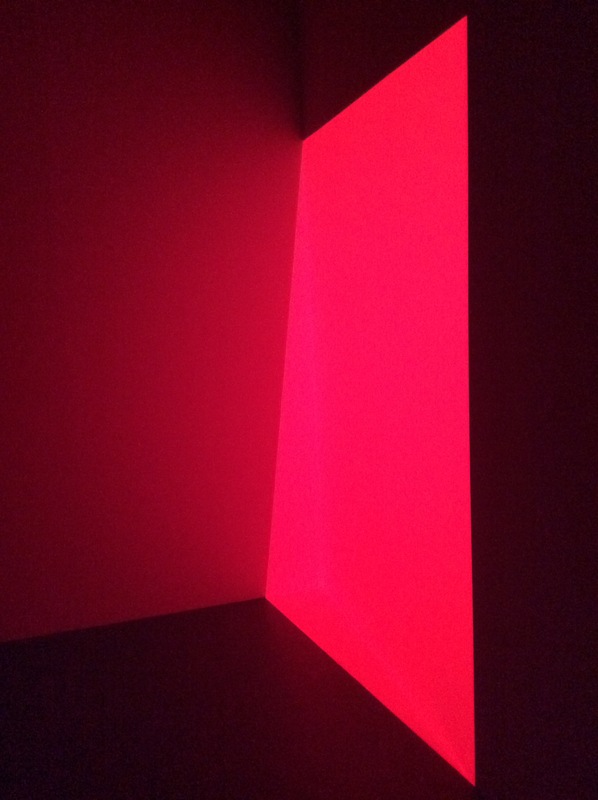 I love Turrell’s work, and oh how I would like to make a trip to Roden Crater. The intensities of the colour he makes use of, the manipulation of geometric form, but above all the ambiguities of surfaces in his work draws you in and keeps you asking questions about the nature of visual perception. In quite close proximity to the light installations in the de Pont museum hang the Amish quilts. They are of varying sizes but many share an intense, but unstated use of colour. I think my biggest problem with the quilts is how they have been displayed. As I have already said, I like looking at geometric abstract paintings. De Pont has the same beautifully sharp spaces and walls that many a modern museum has. Onto these walls the quilts have been hung, with generous white spaces around them, like paintings. It is very difficult (for me at least) to escape looking at them as paintings. And yet, they are not paintings, they are quilts, built up of separate sections of fabric, immaculately stitched together. They have the added charge of a history, a personal narrative and a domestic craft. They are designed to be decorative and to lay flat over a bed as a blanket, at least in part as a functional object. I am used to encountering functional objects in a museum context, where they are to be looked at, contemplated and definitely not touched. I don’t normally have a problem with this, here though it is simply the overwhelming tendency to try and view these objects like they are something that they are not that I find problematic. This is clearly a deliberate strategy by the museum, the hard geometry on Turrell’s work, alongside the equally hard geometry of the Amish quilts. It’s all very interesting, but is it a reasonable comparison to be asking us to make? 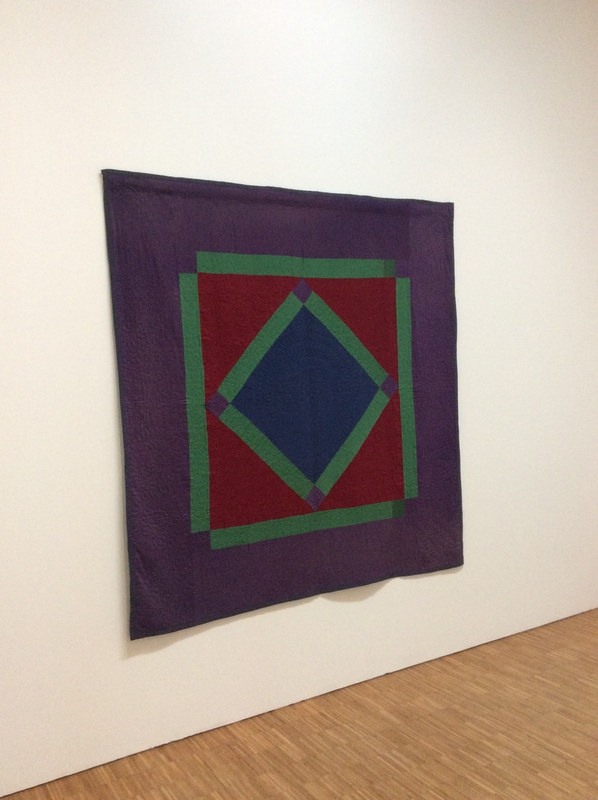 Turrell’s work is designed for the museum space, the quilts very definitely were not. They were designed to add decorative qualities to the Amish home, with its otherwise quite frugal appearance and a surrounding life focussed on family and God. They were also designed to lie flat, in a different plane than the way they are displayed in the museum. In the museum, they are not only removed from their context, but displayed in a way that deposits art historical baggage onto them that seems to be pushing a point that in my view isn’t really there. I liked both parts of the current installations, each for its own merits, but the shared importance of geometry doesn’t make the two parts, if you’ll excuse the Amish quilt context pun, easy bedfellows. For a while now birds have featured in my own paintings as a kind of metaphor for nature and our relationship with the environment around us. In fact I am in the process of scaling up a number of my bird compositions for a commission that I am currently working on. The studio wall shows the early days of this process. My birds are somewhat panicked flocks flying across empty landscapes filled with curving walls that carve up the space and flow from one canvas to another. 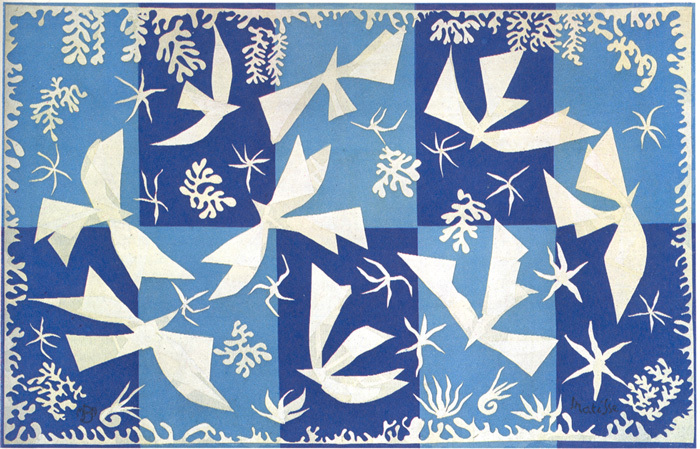 Whilst working on this project I have been coming across other birds in art, firstly Matisse’s paper cuts in the Stedelijk museum in Amsterdam, but then also the sound and video installation made by Marcus Coates at the Fabrica Gallery as part of the Brighton festival. The installation makes use of recordings of people imitating the sounds of the bird dawn chorus that have been greatly slowed down. The human recordings are then speeded up to produce a bird like sound. All interesting stuff, but when combined with the video that has also been speeded up it really makes for a fascinating combination. The film below documents the process and gives an impression of how it all fits together. It is well worth a look. Many years ago I gave a series of creative workshops to children of asylum seekers at an asylum seekers centre that is on the edge of the town where I live. I can’t remember a great deal about what I did with these groups of children in terms of activity. But there are a number of things I do remember about the experience. I found it very difficult, they spoke many different languages, they were all very different ages and they weren’t (it seemed to me) used to someone coming to draw with them. All or these are very challenging factors to someone trying to give some kind of structured recreational/educative/creative activity. All the more so when, as was the case for me at the time, you have virtually no experience of teaching or group leadership. But looking back these are not the things I remember most of the experience. What sticks in my mind years later is the feeling of “otherness” I had of the environment within the fences of the centre. It wasn’t (and still isn’t) a closed fences centre, the people there are allowed out into the area and local town, I regularly see them still. But within the centre I felt that I was somehow in a sort of dislocated place. The building that these people lived in was unmemorable and grey, but it was set in the calm and tranquil beauty of woodland that stretches out beyond the centre for miles. This context was one that I felt very strongly, and it was coupled with an air of uncertainty in the future that you inevitably feel in such a place. The experience as a whole was for me a relatively short one, lasting only a few weeks. But it was one that has stayed with me and has coloured and filled in my thoughts on the issues of asylum seekers and immigration. Immigration is a theme that I have been working with in my art lessons during the last weeks, in combination with my social studies colleague who is dealing with the issue simultaneously in her lessons. It’s a major subject and one that is important to discuss. I do it using the excellent work by Dutch artists Carlijn Mens and Henk Wildschut. Both have produced work that deal with the subject of illegal immigration head on. The challenge for us as teachers is to try and open the eyes of our pupils to a subject that is so far from their world for virtually all of them as they make their daily bike ride through the countryside and town to school. Virtually all of the them, because I have also had young people from Iraq and Afghanistan who were still in the immigration process in my classes in the past. To help bring the theme a little closer to home I am now sitting in a train, along with forty-three fifteen and sixteen year olds and three colleagues heading towards The Hague and the exhibition centre called the Humanity House. Here we will be participating in two activities aimed at engaging and confronting the visitor with the issues of refugees. The kids are excited about the day out it will be interesting to see their response to what we encounter. In the train again for the two hour ride back home with forty three generally very enthusiastic teenagers. Two activities completed, both engaging, informative and in their own ways entertaining in an enlightening sort of way. The humanity game involved letting teams of pupils divide aid resources across scenarios based on real disaster situations.Volcanic eruptions in Indonesia, flooding in Pakistan, chemical poisoning in Bhopal and an abnormally cold winter in Mongolia all played a part. It was all about judging priorities, gauging what is most needed. Simple enough but extremely engaging. In the skin of a refugee took you on a journey through the experiences of a person fleeing a place for whatever reason. You pass through a series of alienating spaces that simulate the feeling of having to rapidly depart your home, to flee into the unknown. Interrogation, confrontation, questions of trust and loyalty all played a part. Parts of the experience left you feeling uncomfortable, possibly scared, but also, greatly informed in an extremely activating and stimulating way. In the context our project at school we couldn’t have asked for more. For myself as an art teacher there is the extra layer that I’ll be talking about in the lessons later in the week when I refer back to the work of Mens and Wildschut. Their work deals with a tremendously serious social issue, and in the case of Mens, one with tragic consequences. Showing pupils how art can be relevant and a carrier of information and opinions about the most up to date of issues is always so enlightening and valuable to show. There they stood, there they were…. is the name of a group artwork that I have been working on with three groups of 14-15 year olds that I teach, sixty-five pupils in total. It has been made within the framework of a cross-curricular project that we run at school. During these projects we take one global theme and explore it in various ways in the context of a variety of timetabled lessons. For our third years the theme is War and Peace. For my part, as an art teacher I use the project to take a look at how the war has been presented in the visual arts through the centuries and how the media deal with it today. It provides a good opportunity to show the pupils how art can tackle the most serious of topics, how it can be quite shocking at times and how artists can use their artistic practice as a form of protest. After such a project there can be little doubt in the minds of the pupils that art offers important communicative possibilities even with the heaviest of subject matter. Having said all that, I have been quite taken aback by the impact of the practical artwork that the pupils have just finished working on. The starting point for the whole project are the piles of shoes (and indeed other objects) that can still be seen at the site of the Auschwitz prison camp in southern Poland. A couple of months ago I spent time showing pupils these heaps of ‘left overs’ from the victims of the camp. I showed them photographs of the piles of shoes, suitcases, glasses, artificial limbs and even hair that is still displayed there. The images were greeted by a attentive silence. I visited Auschwitz a number of years ago, everything about the place is in many ways quite overwhelming, but it was without a doubt these traces of actual victims that left the greatest impression on me. The reaction of the pupils left me in no doubt, the work form that I had in mind was going to be the right one. Each pupil worked on and over an old shoe, first covering it with paper and paint and then a layer of imagery, text and paint. Each shoe became a three dimensional collage that documented one of the many conflicts and it’s victims from war zones around the world in the post-Auschwitz period of 1945 up until the present day. Vietnam, Korea, the Arab Israeli conflict, Afghanistan, Yugoslavia, Iraq, Syria and others all featured in the work. Photographs, artworks, newspaper articles, maps and details of the destruction of each conflict featured on the shoe. On the sole of each shoe a poem was added that the pupil had written about one of the artworks or photographs that we had discussed in the lessons. Images such as Picasso’s Guernica, Goya’s 3rd May or the Eddie Adams street execution photograph from Vietnam. I have been able to display the resulting heap of shoes in a glass case at school that is, in its way, not unlike the glass cases in the actual prison camp, although the pupils’ version obviously being of a much smaller scale. The shoes trapped there, behind glass, and in the film shown here have gained a weight, a charge, that I had hoped for, but if I am honest has been more powerful than I had expected. Watch the film, judge for yourself, the music helps of course, but it is a charge that the pupils themselves can identify and relate to once past the initial excitement of seeing their own particular shoe in the documentation.